Museum passes are available to anyone living or working in Needham with a valid card from the Minuteman Library Network. Click below to reserve a museum pass, or reserve one in person at the Library or by calling 781-455-7559. Passes may be reserved up to 30 days prior to use. Need to View or Cancel a reservation? View or Cancel your reservation yourself or please call the library at 781-455-7559. If you reserve a pass and your plans change, please call us at 781-455-7559 or log-on to cancel, so that the pass can be used by someone else. Passes are circulated for the day of use only and may by picked up at the Circulation Desk the day before use, after 1 p.m., or by 11 a.m. the day the pass is to be used. Please note that coupon passes do not need to be returned.Non-coupon passes are due back before 9 a.m. the day following their use. When the library is closed, passes may be returned in the book drop using the envelope provided. The late return fine for any museum pass is $5.00 per day with a $25.00 maximum. Fee for a lost pass is $25.00. 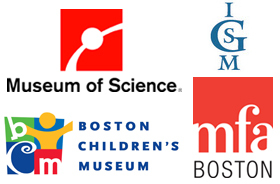 Please note -- Passes do not provide discounts for museum store purchases or parking, nor do they cover any special exhibit fees such as the Science Museum's Omni Theater, Planetarium or Laser Shows.